​The Sun Lakes Sheriff’s Posse is committed to ensuring the safety and well being of our community. Below, you will find some basic, yet effective methods intended to help keep you and your belongings safe. Use quality locks and deadbolts on all exterior doors. Use 3-inch screws on deadbolt strike plates to ensure they reach your doorframe 2x4s. Lock your doors. Every time you leave, even if it is just a short trip. Keeping your doors locked while home can help prevent the possibility of a home invasion. Keep your Garage doors CLOSED, day or night if you are not actively working in there. Additionally, LOCK the door leading from your garage to your home! Pin sliding glass doors and windows to prevent them from being removed from their tracks. Keep the exterior of your home well lit at night to avoid possible hiding places for burglars. Keep hedges and bushes trimmed and below windows to eliminate prowler hiding spots. Know who is at your door BEFORE opening it. Telling strangers or unwelcomed visitors to leave is not rude, it is ensuring your safety. If they refuse to leave, do not hesitate to call 911. If you are expecting a repair person, ask that they show proper ID before opening the door for them. If you are still not sure, have them wait while you call the company and -confirm who is at your door. Keep your car keys and a fully charged cell phone near your bedside for use in emergencies in cases where your landline may be unavailable. Use of your car alarm key fob to -activate the alarm at night if you hear suspicious noises. This may be enough to scare away a burglar or prowler. If you are out of town, even for a short trip, think about the following: temporarily stop all newspaper deliveries, place a hold on your mail delivery, use timers on key appliances like lamps and the television having them turn on and off at various times to replicate someone being home, have a trusted friend check on the house as needed. Lock your doors and keep your windows rolled up. This includes when you are driving to help prevent a potential carjacking or robbery while stopped in traffic. If you have a garage, park your car inside the secured garage when not in use. 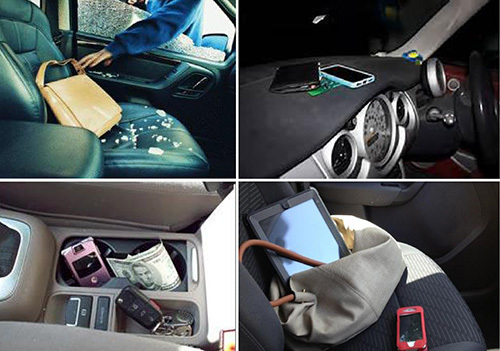 Do NOT leave valuable items such as purses, backpacks, cell phones, GPS units, etc. in plain sight of the passenger compartment. It only takes a second to smash your window and take your items. Use a steering wheel club or locking device. Thieves are opportunists, so if you “harden” the target (your vehicle) they are likely to move to the next car that is easier to steal. Park your vehicle in well-lit areas of parking lots at night.